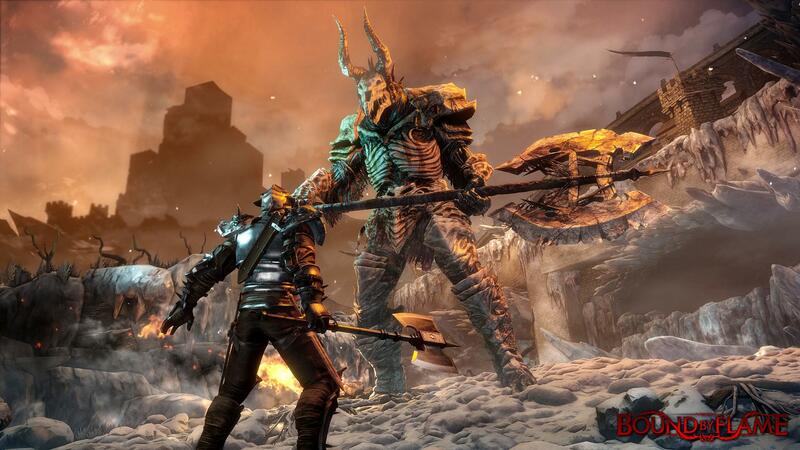 Bound by Flame is a fantasy action-RPG developed by Spiders coming out May 9, 2014. The game presents a dynamic and interactive world where every choice counts. The narrative revolves mostly around Vulcan, the protagonist and host of a ruthless flame demon, whose thirst for power will influence the whole story, including his own. Moreover, this RPG will feature a tactical combat system, challenging enemies, extensive crafting and social companions. If you’re wondering why you should play this game, then read the five reasons below. Depending on the choices made by the player and the influence of the demon, some chapters will offer different scenarios and a different experience, adding important replayability to the game. In Bound by Flame choices can shape everything and everyone around you. The decisions you make regarding yourself will not just influence future events, it will also divide your companions and allies. Besides that, you can gradually change your own appearance by accepting the demon’s offer. The more power you receive, the more demoniac your appearance will become. Indeed, it’s a role-playing game where decisions are meaningful and impactful, so choose wisely or you risk ending up with a story you didn’t wish for. The combat system in Bound by Flame is extremely tactical, flexible and reactive. To successfully defeat your enemies, you’ll need to create your own battle strategy involving both offensive and defensive maneuvers, such as parries and counter-attacks. Also, players can combine magical powers with physical skills, creating unique and personalized builds. It’s possible to level three class trees at once and become a generalist warrior. However, splitting your powers and skills means you won’t excel at anything in particular. During your adventure you will meet many characters (…). According to the choices you made earlier in the story and to your relationship with the demon, you will build friendship, romance, or rivalry with them. In this game, companions will be social, responsive and autonomous. They have their own free will in battle and in social matters as well. During the events of Bound by Flame, companions will express their thoughts, opinions and feelings. However, forging deep relationships is a different matter altogether and it’s always a choice for players to make. If you like or love a certain character, you need to make sure you don’t betray him/her in any possible way; else the result might be drastic or catastrophic. Fighting in this upcoming RPG will be surprisingly challenging and interesting. It’s not just about the dynamic combat system and the companion party assistance. Enemy forces will possess innumerous skills that will bring diversity to every hostile encounter. Additionally, each monster will have its own behavior, which means some might have an extremely aggressive conduct, while others may prefer a more defensive approach. Adaptation and reaction are the keys of success in this dynamic combat system. To ensure customization is not forgotten, Spiders has created an extensive crafting system that allows players to personalize their equipment in multiple different ways. Because a class is not mandatory, players will be able to use any equipment type and even combine armor pieces. But there are consequences. For example, using a more light armor will make you more vulnerable when taking lethal damage. On the other hand, a two hand sword will certainly do more damage than a short one-hand sword. Bound by Flame seems exceptionally fascinating when it comes to customizing and personalizing core elements in a RPG – story, protagonist, skills and equipment. For a non-mainstream game, everything seems well fit and quite promising. I deeply hope that the advertised features are not just being masked under an old-fashioned code and that what we see in trailers and screenshots is indeed the upcoming gameplay reality.